The De Krans The Last Cape Vintage Reserve Port 2010 was awarded a 5-star rating in the latest edition of the authoritative and internationally recognized 2013 Platter's South African Wine Guide, due for release in November. 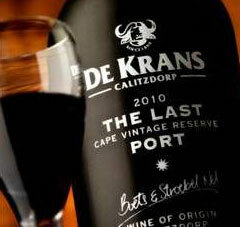 This is the eight consecutive year that De Krans has been awarded a 5-star rating for its port wines. This was the only 5-star rating awarded this year to a port/fortified wine. Sixty-two wines were awarded the prestigious rating out of more than 7 300 wines rated in this year's guide. What makes this award so much more significant is that the 2010 will be the last Cape Vintage Reserve with the word 'Port' on the label as this was bottled and labelled towards the end of last year just prior to the deadline of 31 December 2012 agreed by our government and the EU on using the word 'Port'. 2010 proved to be an excellent year, potentially one of the great years of the De Krans Cape Vintage Reserve Port. Brothers and winemaking team, Boets and Stroebel Nel, were able to bottle a handful of magnums of this vintage which they believe will become sought after collector's items. This flagship port is best described as having a vibrant plum colour, with dense aromas of prune, spice and tobacco, and has the potential to mature for a further 20 to 30 years. A fleshy, chewy mouthful of flavours, showing tannic grip, concentrated red fruit nuances, and a firm structure ensuring considerable longevity. Retailing for approximately R250 per bottle, savour this premium port on its own, or serve with stronger cheeses. This 5-star rating follows in the footsteps of the De Krans Espresso awarded the RX South Africa Trophy for the Most Innovative Wine in 2012, at the 2012 Michelangelo International Wine Awards, as well as De Krans winning the South African Champion Port at this year's SA Young Wine Show, reaffirming De Krans' position as one of South Africa's premier port producers. "We are thrilled by this latest recognition for our Last Port, which further establishes us as one of the front runners within the port industry in South Africa," says Boets Nel. For more information on these or any other ports and wines in the De Krans range, feel free to visit their website at www.dekrans.co.za, or contact Helet Viljoen or Bessie Barnardo at the farm on 044 213 3314 or dekrans@mweb.co.za.